Anyone travelling the A837 north from Inchnadamph have been intrigued by two ruins at the east end of Loch Assynt and close to the road you can find Calda House. The walk to Ardvreck Castle is enjoyable, and the views from the island on which it stands are extremely beautiful, taking in some of the best mountain landscapes in central Sutherland. Ardvreck Castle was originally a simple rectangular structure and was built by the MacLeods of Assynt towards the end of the fifteenth century. Over the years the castle was improved with the addition of a tower and vaulted cellars. After the Battle of Carbisdale (around 1650) the Laird of Assynt captured and imprisoned John Graham, Marquis of Montrose. He was held at the Ardvreck until he could be handed over to and executed by Cromwell's supporters. 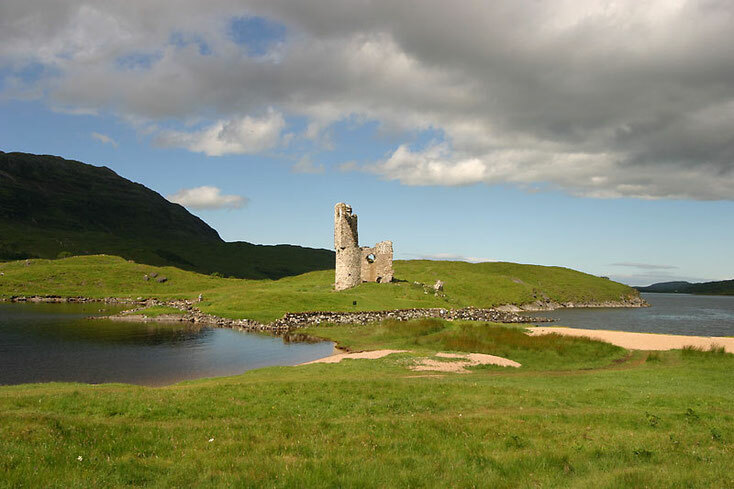 The MacLeods lost their castle to the MacKenzies of Wester Ross in 1672 and after years, the castle was hit and struck by lightning in 1795 and much of the building was destroyed.